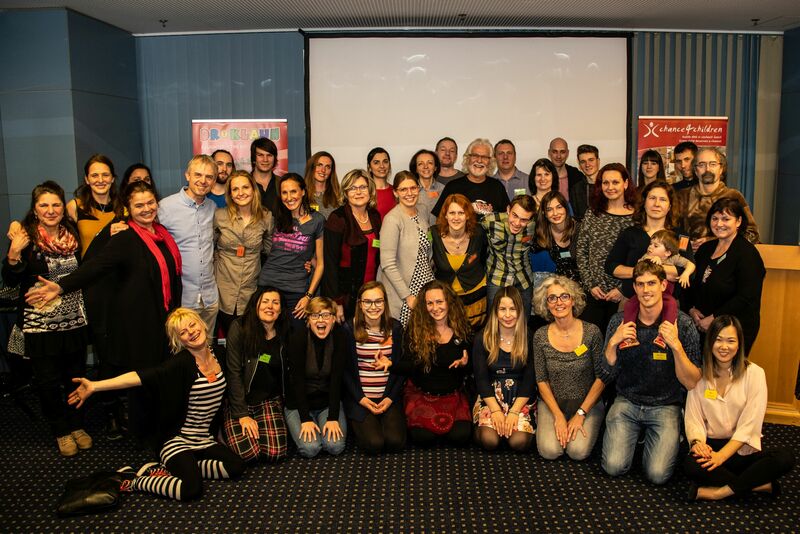 C4C rang in the New Year with an action–packed team-building meeting at the CPI Congress Hotel in Prague – replete with fun, sharing, inspiration, good food and much more. “It took some effort, but we finally succeed to get most of the team together in one place. Some had to come from far, as we’re active across the country”, smiles a happy looking Marketa Franke, C4C’s Goodwill Ambassador and administrational overseer. Together with the C4C staff she had worked hard to organize the event. The team’s teachers, clowns, mentors and staff members visibly enjoyed fellowshipping and getting to know each other better. After an opening note and picture presentation from founder Manfred Franke and co-founder Rafal Wojas, taking everyone on a picture journey of the past 22 years, the teams divided into an array of fast paced workshops. Led by actor Daniel Brown, Anežka Novak, Klára Kliková, Lenka Mrázová and Tomáš Adam (Go Freedom), topics ranged from improvisation, voice coaching, meditation to kindness and teaching happiness. Toward the end of the official part, led by Marketa Franke (who shared her experience coaching, Jirka, a young and somewhat troublesome orphan), team members shared some touching stories and emotional experiences they encountered during their interactions with children in hospitals and children’s homes in the past. The day concluded with a sumptuous dinner prepared by the chefs of the CPI Congress Hotel. A big Thank You goes to the management team around Tibor Bielek who literally went the extra mile to host and feed all attendees on a complimentary basis and to the coaches and mentors who fired up the team with their workshops. “I think we succeed in our task to give back to the great people who work with us, motivate them and make the team stronger by sharing experiences – and to thank them for their hard work”, comments Petra Erguvanli, C4C’s Springboard to Life program manager, as she summed up the day.